How Much Lolly in the Brolly? Help protect your loved ones with Legal & General starting from £6 per month, and support Cancer Research UK! This July and August, Legal & General are proud to support Cancer Research UK. When you take out Legal & General life insurance through easyfundraising, Legal & General will donate £10 to Cancer Research UK, on top of the £25 donation you’ll raise for your chosen charity! Get a quote and apply online today. 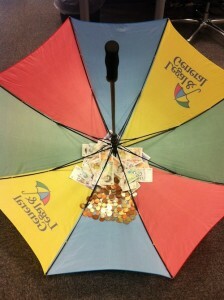 Win the Lolly in the Brolly! Some of you may remember the ‘Money in the Bra’ competition we ran last year with Legal & General in support of breast cancer research. We know you loved this fun way of raising awareness so when Legal & General asked us to come up with another competition we got out thinking caps on! 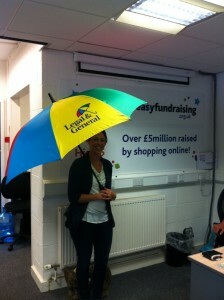 So we’re pleased to introduce the L&G Lolly Brolly! Guess how much money is in it and if you are right, you’ll win that amount for your cause, plus the same amount for Cancer Research UK! Thank you to Legal & General for their support with this. Cancer Research UK funds over half of the UK’s cancer research, including the life-saving work of over 4000 scientists, doctors and nurses fighting cancer on all fronts.